So…”almost frozen”, you ask? Well – Think sorbet. If you aren’t consuming this pie after it firms up in the freezer, you can store it there for several hours. Just defrost for about 20-30 minutes or so in the refrigerator prior to serving. You want it just thawed enough to cut into. It all begins with watermelon, rind removed and pureed in a food processor. Be sure to strain to remove the seeds and pulp. We add a little lemon zest and juice along with some vegan creamer and poured into prepared pie shells. 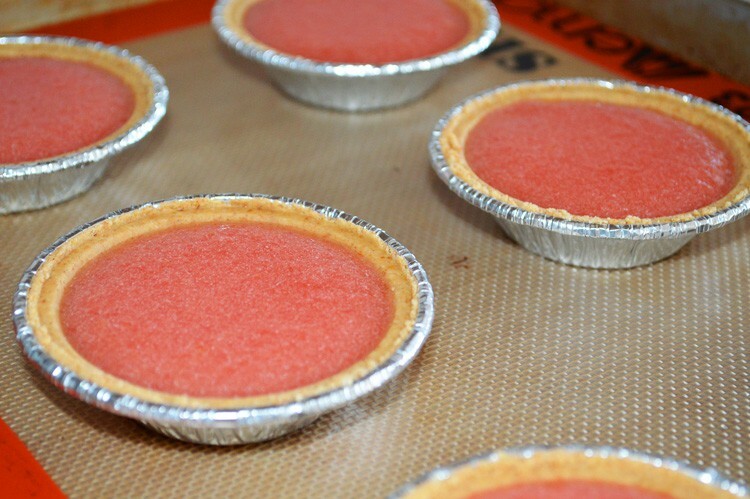 You can use full size, but we found these pre-made individual pie shells made of graham cracker crust. You could certainly make your own. Freeze just until firm and serve with our coconut whipped cream and a sprig of mint. Or, if you are not serving immediately, these can be frozen. Thaw in the refrigerator for about 30 minutes prior to serving. We used pre-made graham cracker pie shell crusts like these but you could always make your own from graham crackers and vegan margarine. Or vanilla wafers and margarine. You could also buy a full size pre-made pie shell. Just be sure they are vegan. 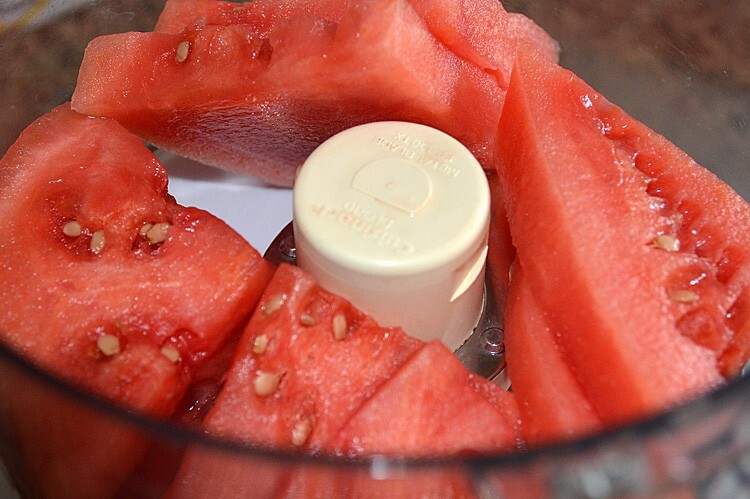 Remove the rind from enough watermelon slices to make 1-1/4 C once strained. Puree the watermelon in the food processor. You have to strain it to remove the pulp. We only want the juice for this recipe. Place 1/2 of the juice into a small saucepan. Add the agar powder and whisk together. Then, over medium heat and whisking occasionally, cook for about 5 minutes to thicken. Cool slightly. In the remaining watermelon juice, add the lemon zest and juice along with the sugar. You could add less sugar, it's important to taste to see how sweet your watermelon is. Add the creamer and whisk all ingredients together. 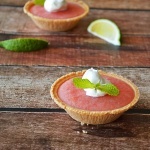 Combine the cooked watermelon juice with the remaining ingredients. Pour the mixture into a glass measuring cup for easier pouring. Pour into prepared shells and freeze for 2 hours and transfer to the refrigerator until serving. Alternately, you could could just refrigerate for 4 hours. These should not be frozen, just firm. 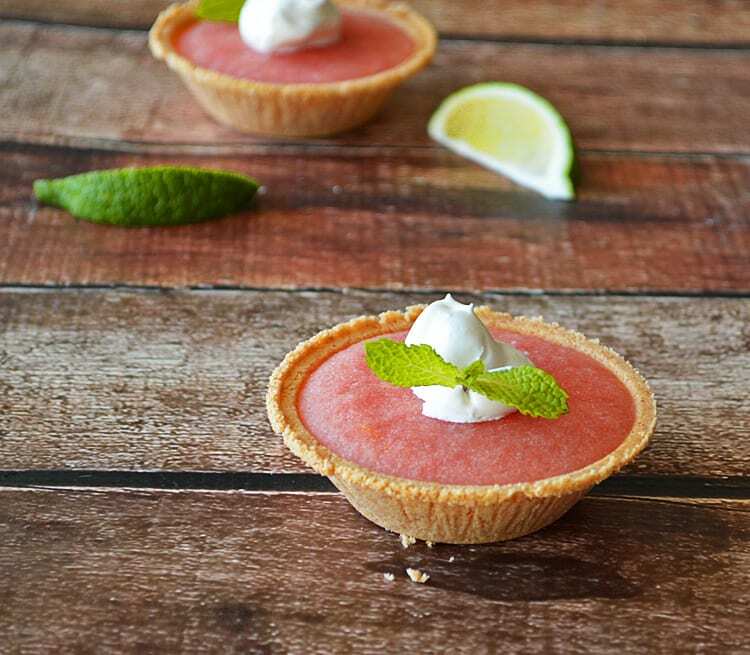 Serve with our coconut whipped cream and a sprig of mint. This is making my mouth water! 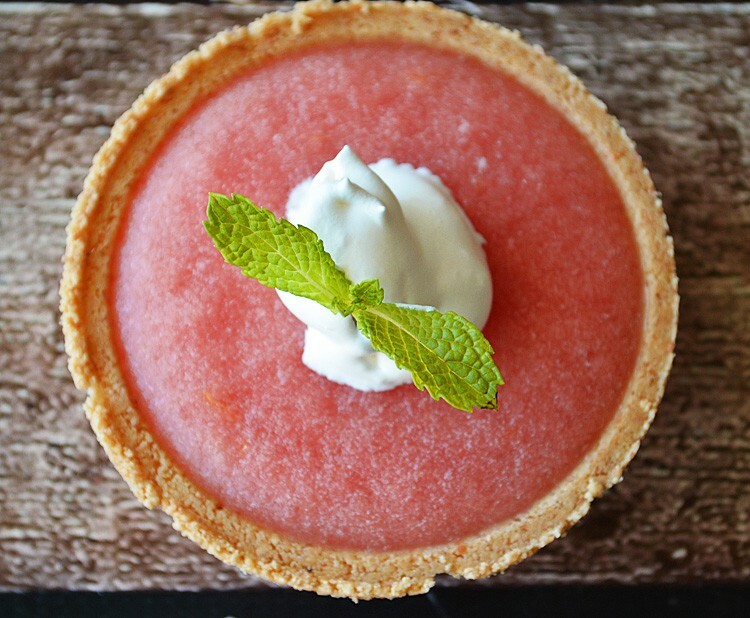 It’s been getting really warm out here and I feel like this dessert is the perfect combo of satisfying + refreshing. So pretty too. I can’t wait until watermelon season hits us! Sounds great. Best thing is it looks good too! Win/Win! Thanks for sharing! This blends to of my favorite foods bananas and watermelon! Can’t wait to try this! Yummy and refreshing! Going to try the same thing with strawberries instead of w-mellon!